Worksheet - Where is the Preposition? 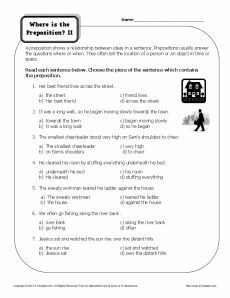 On this preposition worksheet, students read the sentences and then choose the piece of the sentence which contains the preposition (from four options.) There are seven sentences / questions. This worksheet supports 4th and 5th grade language arts core standards to form and use prepositional phrases and explain their function in sentences.